Remember when you were a kid and there was that gargantuan mulberry tree in the neighborhood. You always knew where it was because when the berries were ripe, the sidewalk beneath it began to turn purple as the berries fell and were stepped on. Remember eating those berries? They were delicious. They still are. And mulberries are good for you too. They are loaded with antioxidants and other nutrients like anthocyanin, beta-carotene, calcium, carbohydrate, dietary fiber, fatty acids, iron, magnesium, malic Acid, phosphorus, potassium, protein, and resveratrol, Vitamin B, Vitamin C and Vitamin K. So why can’t you find these in the grocery store. My guess is because of the stems. The stems stay with the berry when the fruit is picked and though they are edible, most people don’t want to eat them. Nor do they want to take the time to remove them from each berry. 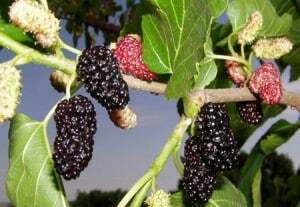 Produce growers can grow another crop that is less labor intensive and make more money so mulberries never became a cash crop. However, mulberry trees are quite prolific and hardy. They grow almost everywhere. Chances are you know someone who has one or where to find one growing wild. Take a bucket and spend an hour, certainly no more and pick your fill. Not only can you eat them fresh but you can dehydrate, freeze and can them. They make wonderful jams, jellies, pies, muffins and all sorts of baked goods and desserts. You can use them in place of any other berry in any recipe you already have. Mulberries do have a couple of drawbacks. The purple ground-staining mentioned above also occurs with skin and clothing. It is not permanent on skin but good clothes can be ruined by mulberry stains. Don’t wear good clothes to go berry picking. Also check your shoes carefully. If you’ve stepped on any mulberries, you can track the purple juice into your car or home and stain carpeting too. Mulberries come off the tree with their stems intact. The tiny green stems are completely edible and have virtually no taste. It is safe t eat them and to freeze the berries with the stems still on. However, this is a personal choice and the stems can be removed. Removing the stems can be challenging but if you purchase a new nail clipper and use it only for the purpose, you can make the job easier and salvage more of the berries. Find a neighbor or a local farmer with some old mulberry trees, get permission and pick yourself some free, healthy fruit while you relive some glorious childhood memories. There is a big Mulberry tree out in my back yard. I never knew what to do with them, except to eat them. Because of the berries you will also see a lot of different birds in mulberry trees. So like any berry picking it’s also good for bird watching. I have never gotten so much enjoyment out of our mulberry trees as I have this year. I washed them and tossed them on to a sheet pan and then froze them. The stems will break off easily while still frozen and then they can be popped into a zip lock bag. Such a tasty addition to cereal or yogurt or just pour some milk or cream over them and enjoy those tasty nutritional benefits!